Looking great!!! The sliders look great, as well as everything else! Keep the updates coming! I was cruising the classifieds on race dezert, things went fuzzy, and next thing I know, this box jumped in back of my truck last night. OOPS??? See any 4.0/4.4/4.5's up there? All the time... but they're all 16s or 18s... gotta build a jungle gym in your bed or mount those suckers through the hood! yellowranger1 wrote: All the time... but they're all 16s or 18s... gotta build a jungle gym in your bed or mount those suckers through the hood! Truck is getting links and said jungle gym if I'm drunk enough I'll hole saw the hood and then I'll just have to go long travel up front! Not a whole lot going on with the Blue Whale lately, been busy with work and friends weddings, etc. so no dirt under the tires... 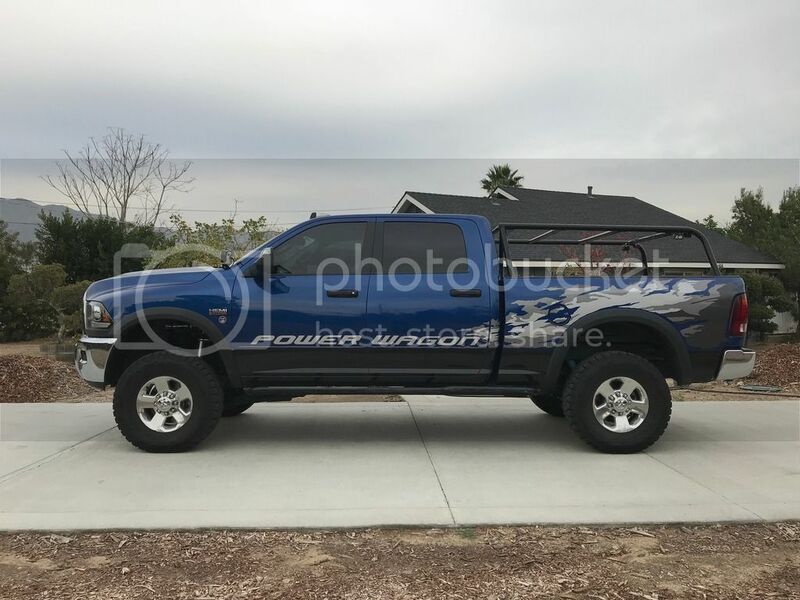 Couple small updates coming for the truck though! I've been spending some time driving my gfs Forester or my parents Cherokee to weddings, etc. Both of those have factory HID headlights, both of which made me want more out of my OEM lighs. 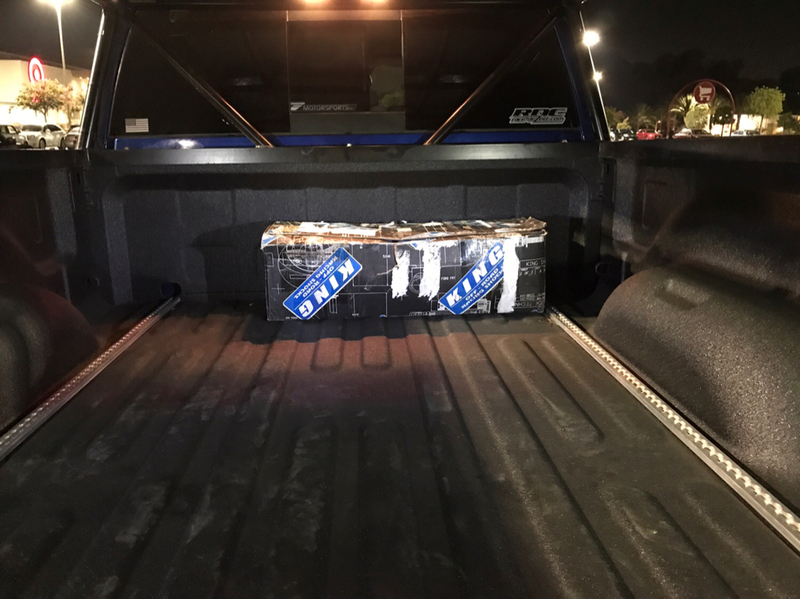 I talked to a friend who runs a company called Vantage Optics (he does a lot of projector and hid conversions for the E Series vans), he put together an HID kit for the truck, as well as an upgrade for the fog lights. Looking forward to more light on the road next time we hit the road! Suspension wise, I've began trying to chase down a wobble in the front end, it feels as if the front end wobbles when hitting a bump at speed, or like a tire is way out of balance. First step was get the Toyos re balanced, turns out I'd lost a few weights in a couple of wheels. That helped a tiny bit but it persisted. Had the tires spun on the wheel, re balanced, all checked out a ok... wobble is still there. Put the truck on stands, checked for excessive play in the balljoints and checked nuts/bolts, everything seems fine. 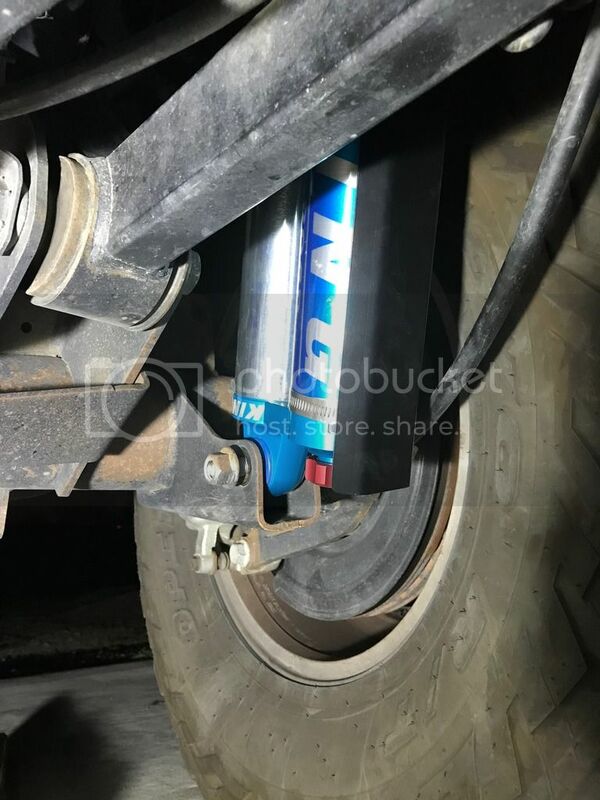 I figured maybe a trac bar could help, after digging around on Thuren's site, I saw his recommendation that the trac bar be replaced at +/- 20k mi. I'm at about 25k with a decent bit of off road use, hopefully a trac bar with new, better quality joints will help get rid of that wobble/deflection I'm feeling under the front end. I went ahead and ordered the rear trac bar as well, the side to side bounce when loaded was getting old, felt like I was driving my dads JK. Have you had an alignment done lately bad castor angles can cause death wobble like symptoms? Haven't tried an alignment yet. Aside from that symptom, there aren't any other noticeable signs of alignment being out off like wandering or pulling side to side. It's definitely worth a shot though, might be something barely out of whack. Thanks for the suggestion! I hear ya, life gets in the way then months go by... try airing your tires air down to 35-40 psi (if they're E rated) see if that has an effect on the wobble. If that doesn't check it, it's probably the crappy stock steering damper going south. Few updates, I think I solved the small wobble/feedback I was getting through the steering wheel. I installed the Thuren front track bar, no real improvement with that shake, although the truck does feel a bit more solid over bumps. I also installed a Thuren/King steering stabilizer, this seems to have done the trick. I hadn't noticed until I was underneath tightening the track bar axle bolt, but my OEM stabilizer had a couple of good dents in it. No visible leaking, but it gave me an excuse to add something shiny under the front end, and so far I'm happy with it. I also installed the Morimoto 5500K/35w HID kit in the headlights with the CANBUS standalone adaptor, no warning lights, and bulbs have been firing flawlessly every time, even after a good bit of off road use with lots of annoying washboard. Much better output than stock halogens. Fitting the ballasts and CANBUS module was proving to be a royal PITA until I looked up! Theres tons of space above and behind the headlight to mount both. I ordered both front and rear track bars from Thuren, and finally got around to installing the rear. Very pleased with the kit overall, looks like a quality piece, and the joints look simple to service/replace (snap ring and a press). 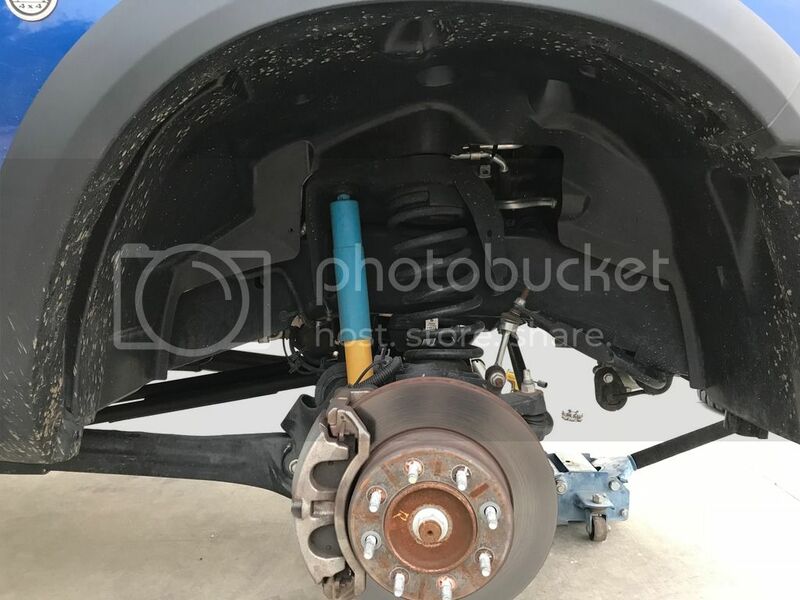 The bracket is beefy, and looks like it does a good job of sandwiching the OEM axle mount, with everything properly torqued down, I don't see this bracket coming loose anytime soon! I purposely left my truck loaded from last weeks camping trip to do a comparison to the stock track bar over one problem bridge near me (long right hand turn, oddly spaced expansion joints). Last weekend, we were extra heavy, lots of firewood, 2 loaded coolers, and some of our friends gear... This problem bridge upset the truck enough that the ABS went nuts and tried pulling me into the next lane. I hit the bridge after installing the Thuren rear bar, 75mph, held on tight and prayed... NO DRAMA! Front end did it's thing like any solid axle truck, and the rear stayed put. Very minimal side to side movement, I highly recommend this upgrade! *Install note* DONT BE LAZY LIKE I WAS. Save yourself some headache and lower the spare. It would have been a lot easier to drill out that hole (picture with the drill) had I just dropped the spare tire. I got home from work a bit early yesterday... I'd had a redbull and was feeling motivated. I got out the jack stands and started tearing down the front suspension. I took my time with tear down and install, cleaned up the frame and coil buckets a bit, and from start to finish it took me about 4hrs and 2 beers working solo in the driveway. The Carli 3" Hemi Coils are in, as are the Carli/King 2.5s, all that's left for the front end is to readjust the track bar and re-center the steering. Carli 3" springs and shocks installed here, rear is stock springs/shocks in this pic. 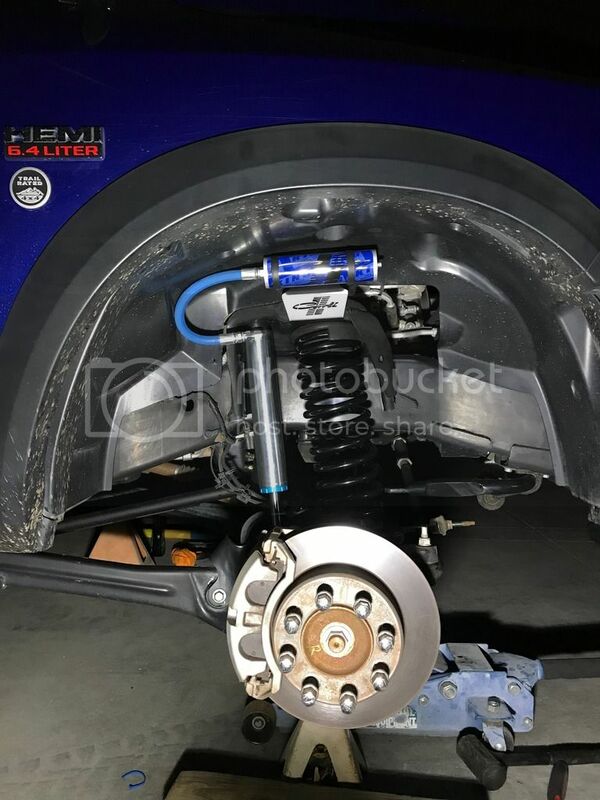 Rear Shocks - I installed these today after work, along with a pair of reservoir guards to protect the compression adjuster knob from rocks and debris thats kicked up by the front tires. ...Don't worry, that bottom bolt was tightened after the pic was taken! Is that a Dethloff skid under there? Sure is! I love it! It seems crazy that they'd go through the trouble of designing and including the factory skids on these things, yet leave such a critical area so vulnerable . I hadn't smashed my pan or anything like Mike had, but I've tapped that exhaust crossover tube a couple of times. Only took 30ish minutes to install some peace of mind, solid product! Nice upgrades, did you have the adjusters added to help with rear squat/sag when loaded or something else? Time to take those Kings through some paces out in the desert! Last edited by coder on Thu Jan 18, 2018 1:47 pm, edited 1 time in total. Nice upgrades, did you have the adjusters added to help with rear squat/sag when loaded or something else? Time to those Kings through some paces out in the desert! Can't wait to get these shiny shocks dirty! If all goes well, we're going to try and hit the road this weekend! On road, the feel is very similar to stock, but the harshness of cracks in the road or expansion joints is gone. On my way home yesterday, I deliberately hit this BIG dip by home (big as in seeing sparks from cars is the norm, and occasionally someone will leave a bumper behind!). 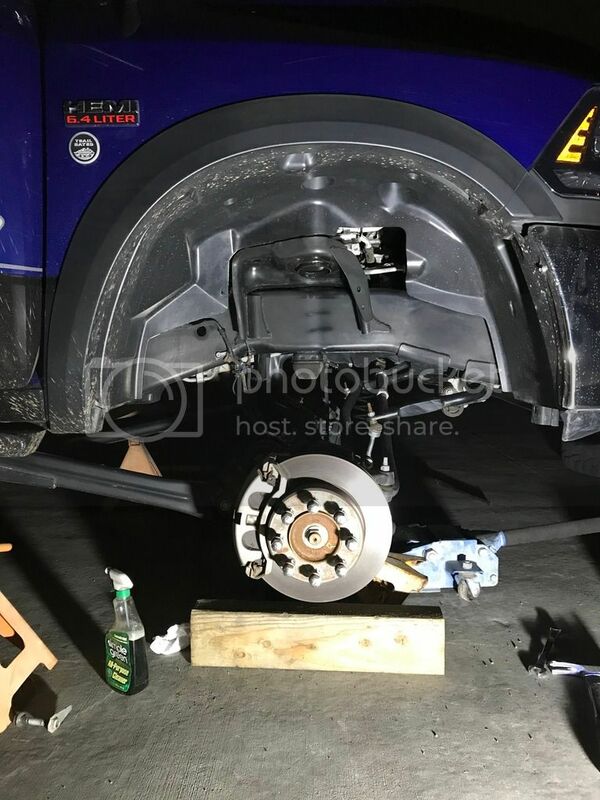 The front was done and the rear was still on stock shocks, the front completely soaked it up without drama, while the rear came crashing down on the bumpstops as expected. I intend to do further research in the name of science today after work to see how the rear shocks feel. Can't wait to get these shiny shocks dirty! What you described above is pretty much Carli's suspension design philosophy "softer ride with more control and bottom-out resistance in the backcountry". Do you plan on getting their rear coils too? Hahaha, I admit I'm torn on getting them dirty, but it'll be worth it! So, drove the truck a bit yesterday after work... Front feels great on road with the Carli valving, similar to stock, but a bit sportier without any harshness over expansion joints, etc... The rear is a different story though. 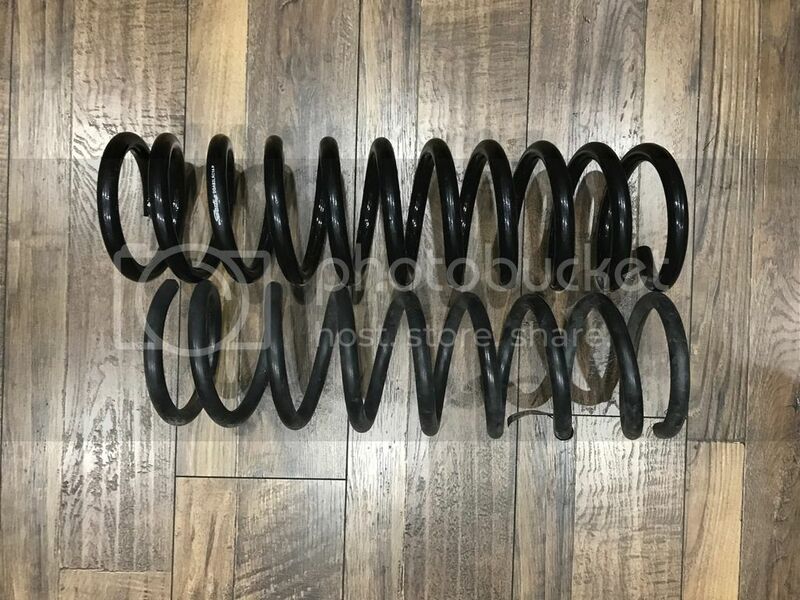 These were not purchased as a complete Carli set, the rear shocks are King OEM series 2.5s, which King sets up for a diesel. As of now the rear adjusters are only turned in 2 clicks on each side, and they are too stiff, not harsh, but it feels more like a standard 2500 in the back. I out some weight in the bed last night, about 700 lbs, and it felt much better. I'm going to re-valve to get a smoother highway ride when empty, then I can turn the adjusters in a few clicks to handle the weight of the RTT and gear in the dirt. Yup! I've had a pair of their rear 3" coils sitting on my rack for a while now. I picked these up from a friend when he changed his camping setup and started carrying more weight. He went to a Decked system, flippac, and carries a good bit of extra gear/tools so he went up to their stiffer spring. I should have time to get those in this coming week. I wonder if you could have Carli put in their valving (valves and tuning) to match the rear spring rates? They use modified valves so you can't just tune factory King's and get the same outcome. Carli and Thuren are pretty tight lipped about their valving specs, and thats a-ok. It takes a lot of time to fine tune and come up with a base line valving setup that works for a majority of folks, or in Thuren's case, several stages and knowing how to tailor each to a customers needs. 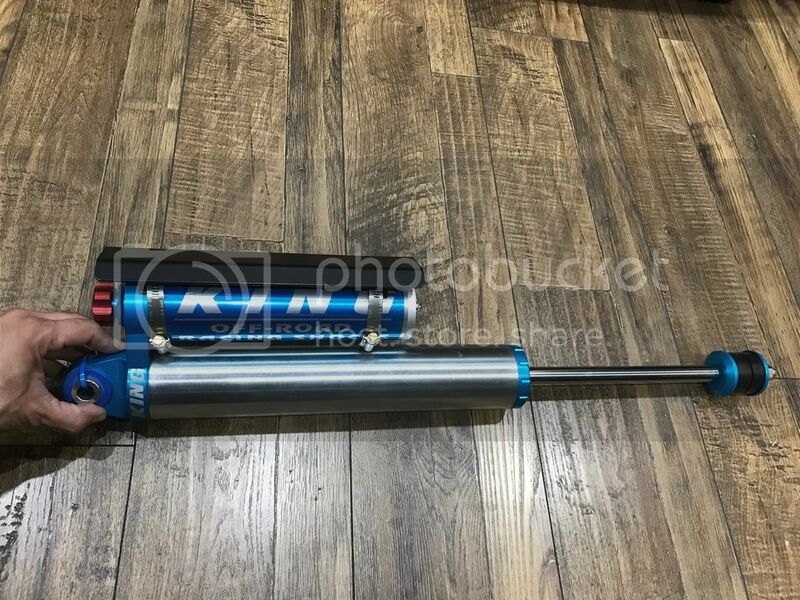 As far as the valving in my shocks goes, I'm not really concerned with getting the exact specs from Carli, as I'll be re-valving the fronts anyway, but Carli's base valving is MUCH better than kings base valving which seems to be more for a diesel that stays on road. I'll be pulling the shocks off again next week and taking them apart to measure and take note of what's in each and then talking to a couple of friends that do shock tuning, and have set up several of these types of trucks to get recommendations for new valving stacks. I'll post an example of what the valving looks like for those that aren't familiar. The valving is basically made up of stacks of super thin heat treated washers that are measured by the thousandths of an inch, on either side of the piston for compression (under piston) and rebound (above piston). Those shims are the same whether the shocks say Carli or Thuren on the sticker, but where they can work in some secret sauce is in their piston design, how much it flows, the free bleed allowed, etc. King (and other shock manufacturers) offer different pistons as well to suit your needs, hi/low flow pistons, etc. This thing should be riding MUCH better soon! On a side note, the adjusters on the rear shocks made a big difference. The truck was pushing through the shocks and bottoming easily with the added weight of out tent and gear. I turned them up 4 clicks and it really helped keep the back end off the bumpstops.